Kimberley’s Beauty Blog was first launched in 2012 after much encouragement from my friends to start a blog, They would often ask about products I used, where I bought my clothes or what technique I used to style my hair etc so when they suggested I shared my views with a wider audience, I thought why not? What have I got to lose? I’d run a couple of my own websites when I was a teenager and soon learnt how to create my own graphics and write code so I could put more and more of my own personal stamp on my corner of the internet. I’d had a break from it for a couple of years but always had the bug so it didn’t take me too long to get back into the swing of things and design my first look for Kimberley’s Beauty Blog. I had assumed the odd person may come across my blog here and there, but little did I know it would turn into more than that… not just a hobby but a total lifestyle change. I’m so grateful for what blogging has given me. Not only am I able to share and express my passion for all things beauty, fashion and lifestyle related but i’ve also made a good number of friends and entered a whole new community which I absolutely love. initially, Kimberley’s Beauty Blog, was purely focused on the beauty industry, mostly product review and hauls about anything from skin care, to hair care and make-up. Over the years I expanded this to include my other interests around fashion and home life (candles, homeware, cooking etc) as well as some more personal aspects such as my wedding. I love that this space allows me to be versatile and thankfully my audience have been very supportive of the different type of content I like to include on my blog over the years. Born and raised in the UK, I have a First Class Joint Honours degree in Business Administration with Computing and have a full time job which allows me to be part of both of these areas. It can make it challenging to also find time to blog and in recent years due to illness i’ve also had to take a break for longer than I would have liked. 2018 is the year of the re-launch of Kimberley’s Beauty Blog and it is something I am extremely passionate about. I have missed it tremendously and I can’t wait to be more engrossed in this world again. I want to take this opportunity to thank you for all your support over the years, words cannot express how much this truly means to me. If you are a brand wanting to work with me, please take a look at my PR Page for contact details. I’d be happy to hear from you. 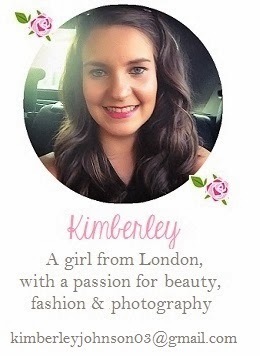 If you are a fellow blogger or reader of Kimberley’s Beauty Blog please pop by and say hello!